When it came time to design its own dropper post, e*thirteen went after three main goals: simplicity, reliability, and durability. Most droppers fail because of either an air leak or a hydraulic failure, which is why the TRS+ Dropper has neither air nor oil in it. It’s coil sprung, just like the original dropper post, the Gravity Dropper, and there’s no oil damping system whatsoever. This means the post does come up quickly, but the spring isn’t so strong to create a harsh top-out. 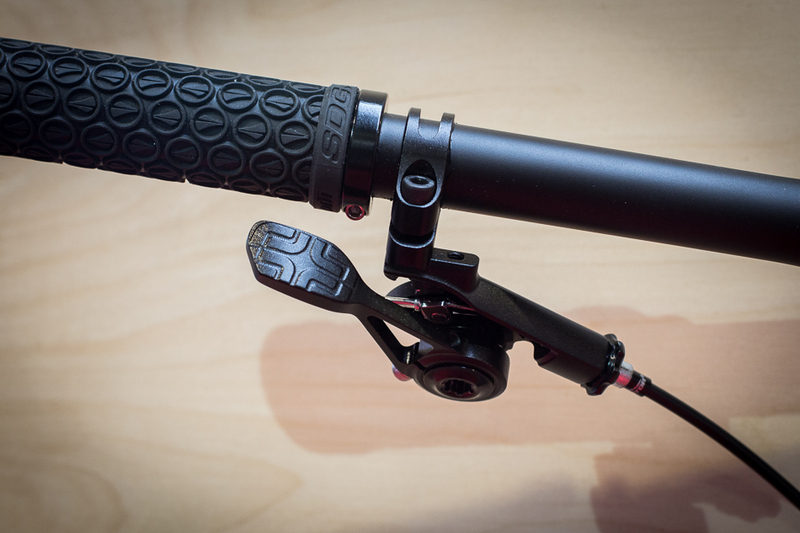 The 150-millimeter-travel TRS+ Dropper is not infinitely adjustable. Instead, it has four stops, which e*thirteen went ahead and named: 150 millimeters (all the way up) is Climbing, 110 millimeters is Cruiser, 75 millimeters is Control, and 0 (all the way down) is Downhill. The spring-loaded cam mechanism that locks the post into these four positions is designed to be simple and reliable. The lever mimics the look and feel of a front shift paddle, and features adjustable clocking and barrel adjustment. The angle at which the housing exits the lever closely matches that of many brake levers to ensure clean routing with the brake line. 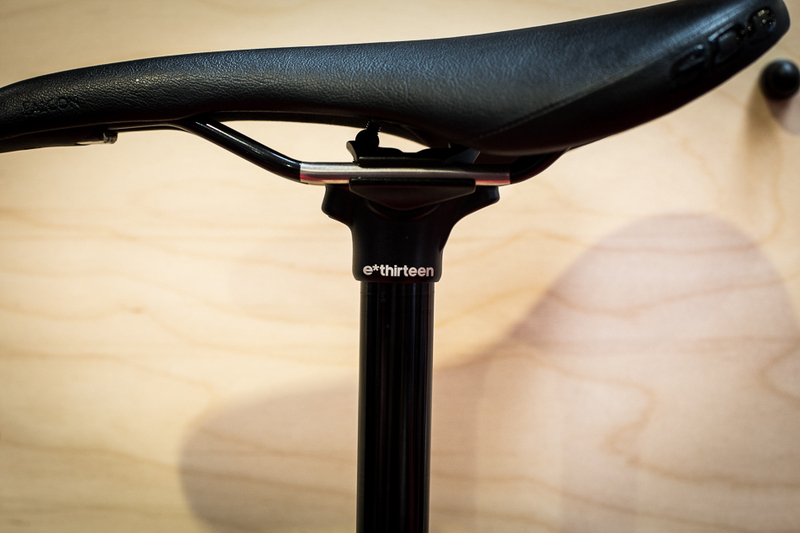 e*thirteen designed the TRS+ Dropper for the cable head to sit at the seatpost-end and to be anchored at the lever-end. 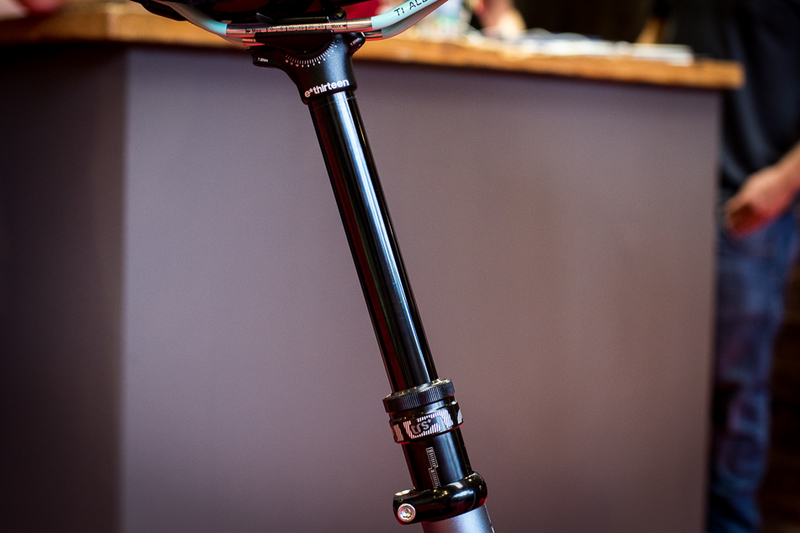 For seatpost removal, the cable head can easily slot out of its seat at the bottom of the post without the use of tools. MSRP is $280. 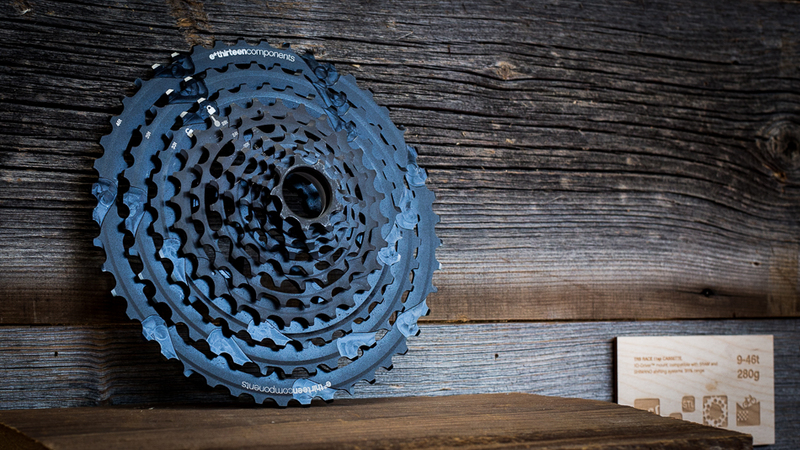 Offering an Eagle-shattering 511 percent gear range, the new TRS Race 9-46-tooth 11-speed cassette provides even more range than SRAM’s new 12-speed 10-50 drivetrain at a fraction of the price. The secret is the industry-only 9-tooth cog. SRAM’s 50-tooth low gear means that riders can generally use a larger chainring up front, which results in an easier low gear and a faster top speed than its 10-42 11-speed system. But e*thirteen went the other direction. By using a 9-tooth cog for the high gear, riders can use a smaller ring without sacrificing top speed, which provides more ground clearance. The $350 TRS Race cassette mounts to SRAM XD driver bodies, and will work with any SRAM or Shimano 11-speed drivetrain.